March 10, 1983 was a sad day for Staten Island bodybuilders. A long time member of my gym and one of the most well-liked and respected bodybuilders passed away after battling cancer. His name was Jerry Valente. I first met Jerry in the summer of 1976, after reading an ad about some exercise equipment in the Staten Island Advance. I was preparing to open my club and was looking for several pieces of gym equipment. Jerry had a Dan Lurie Moon Bench for sale and I took a ride to his house to see it. When I drove into his driveway Jerry was there waiting for me with the bench. Jerry was a big strong guy who had an easy smile and friendly personality. He was also a former training partner of Lou Ferrigno. The two bodybuilders use to train together at the original R&J Bodybuilding Studio on Avenue U in Brooklyn. Photos of Jerry appeared in physique publications nationwide from time to time. He was a well-known bodybuilder that had competed against some of the greats in the sport including three time Mr. Olympia, Frank Zane. After talking to Jerry for a while he showed me his well-equipped home gym and I was amazed at all the exercise equipment he housed in his spacious basement. He had everything imaginable and was replacing the Moon Bench with a new piece of equipment. After the tour, I purchased the bench and invited Jerry to stop and train at my club any time he liked. About a month after my club opened, Jerry stopped by to see what it was all about and started to lift weights alongside the members. He was an inspiration to watch because he performed his exercises in perfect form. Not before long, Jerry became a staple at the gym and was always happy to give training advice to my club’s members. That is what Jerry was about. 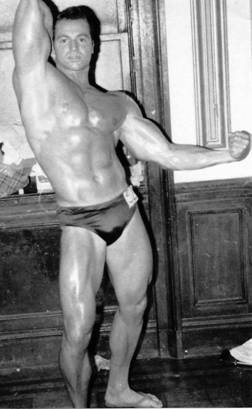 He loved bodybuilding and was always there to lend a hand. When I was training for the WBBG Mr. Staten Island competition in 1977, Jerry was there for me, as he had been so many times before. He constantly monitored my progress and even brought a dais to my gym to help me with my posing. At the premier of the film Pumping Iron, Jerry introduced me to his old training partner Lou Ferrigno. The two had been out of touch for several years, since the time Jerry was nearly killed in a job-related accident that left him partially deaf. Lou hugged his old friend and took Jerry backstage to get reacquainted. Everyone liked Jerry! He was a positive person who gave it his best. In 1982, he was training for a physique competition when he became ill. Jerry fought against all the odds as he sought the medical attention needed to rid himself of this terminal illness. Sadly, Jerry lost his battle the following year, and to this day is remembered fondly by all those that knew him.